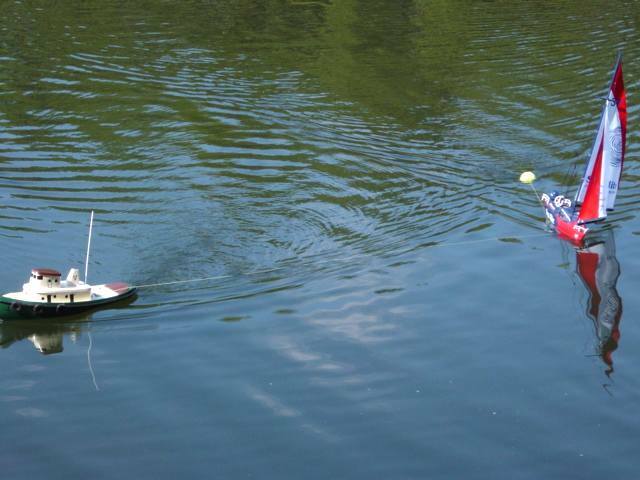 Towing Fast Electrics or Scale Boats With A Tennis Ball or Toilet Float. Great for basic recovery. 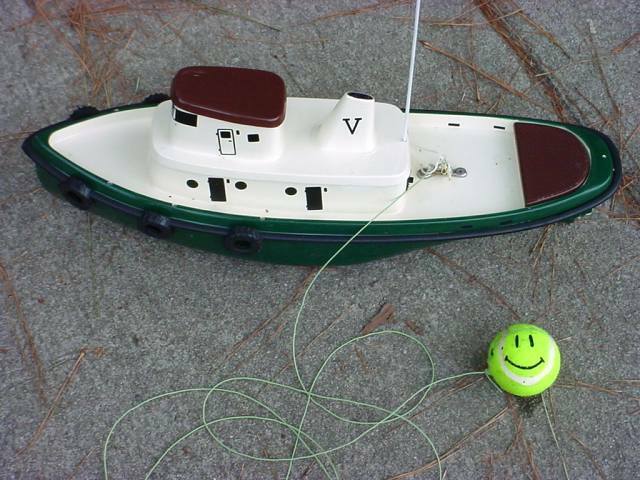 Requires one tennis ball (smiley face optional) or plastic toilet float, 12 feet of floating fly line, and a stainless & brass fishing snap swivel. 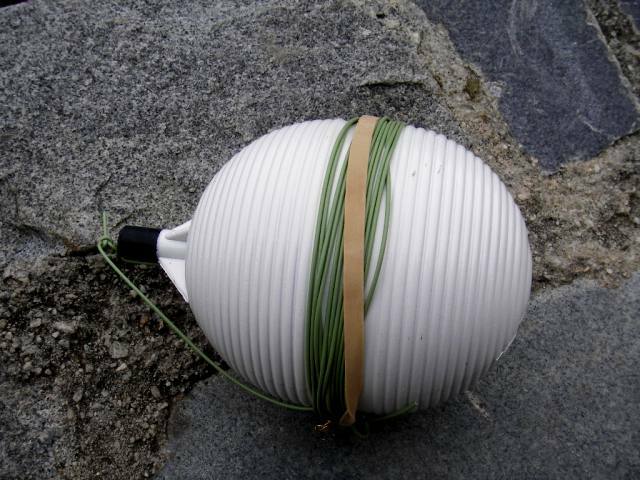 Tie the floating fly-fishing line around the tennis ball. Dab hot glue on top of the fly line on 5 or 6 spots to secure it to the ball. Tie the other end to the snap swivel. Loop the snap through the tow point and clip it to the line to attach to the boat. 12 feet sounds like a lot, but it is necessary. 10 to 12 feet is ok. Since the "tennis ball" setup was published, we found that a plastic toilet float works better for two reasons. It stays on top of the water creating less drag as you motor out to the disabled boat. 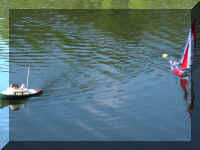 It is larger and provides greater buoyancy if the disabled boat sinks under-tow. This one is painted white for visibility. Just drill a hole through the stem of the float and tie on the line. 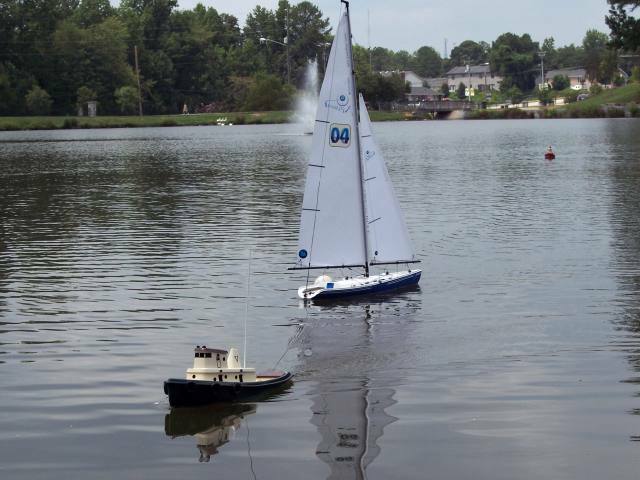 Here, in light winds, the tug recovered this Nirvana II sailboat by Megatech with the toilet float rig. 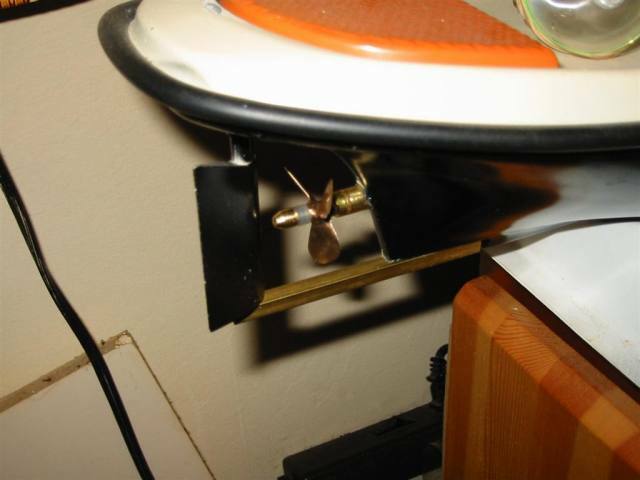 Due to resistance by wind or rudder, hooking up to a sailboat in high winds could end up with the sailboat towing you! 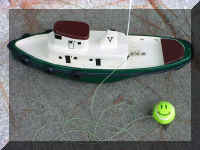 The tennis ball will work on only smaller sailboats. You can see that even with this small 24" boat, the keel and sails are resisting the trip home. 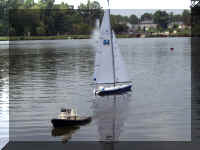 With the tug pulling left and the sailboat pulling right, both are headed strait toward the camera. Here is a small movie (250 KB) showing the tug driving by the disabled white boat. It does a U-Turn, snagging the rudder of the boat with the floating line and securing the tow with the ball. 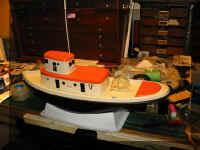 Mike has been using his tug to recover fast electrics for about 1-1/2 years. Here is a tip from him. This is how I set mine up for towing. The first thing I did was set up one of those Dumas props (for efficiency and a scale appearance), as shown on the picture. I turned a brass acorn nut down for the prop nut, and added a small piece of silicon tubing as a shock absorber. Also, I repitched the prop to about 1.7 to give it more drive. It tows at the same speed as cruising using 7 cells (a 3000mAh NiMh car pack). The tow rig is a spin float with around 12 feet of 8 pound test mono connected to it. The deck hook is a curtain hook that I bent slightly, and is screwed into a chunk of plywood that I glued under the rear deck.